It took 200 years of dealing with with the invasive European green crab before American scientists finally decided to head back to the crabs' source. And when they did, they discovered that the invasive scourge of our estuaries is a straight up Italian delicacy. 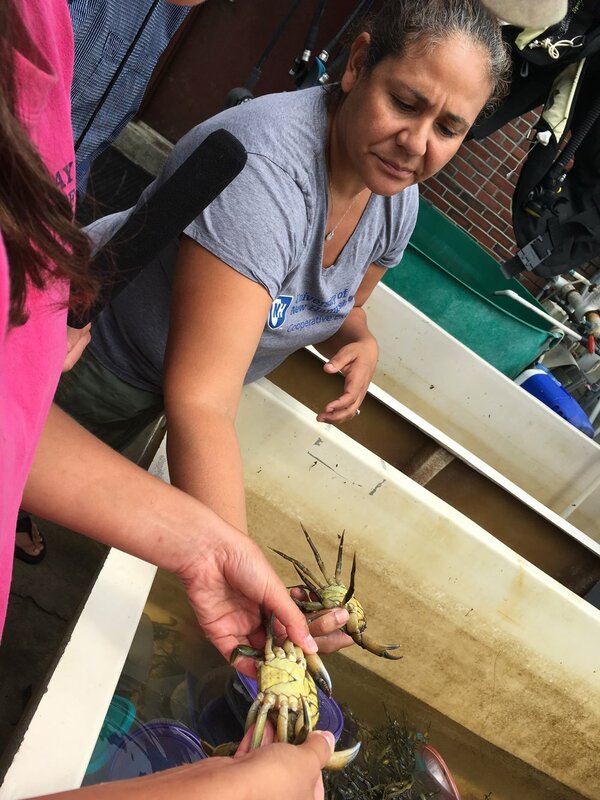 Watching Gabby Brandt, a University of New Hampshire marine scientist, detach a green crab that had vice-pincered itself onto the skin between her thumb and forefinger — calling it a “brat” once she had it off — you might ask why she would want to study them. Up here in the Northeast, green crabs are absolutely everywhere. If you wade into the ocean and find a crab just below the low-tide line, it’s probably a green crab. Gabby thinks that in terms of overall number of crabs, they’re probably the most abundant in our waters. They’re from Europe, but have been on the East Coast of the United States for 200 years. They’ve invaded Australia, South Africa, the West Coast of the U.S., and South America. In other words, they’re now on five of the seven continents. However, as you and I and anybody who likes seafood are aware, crabs are delicious. A friend of Gabby’s from Louisiana pointed this out several years ago: why not eat them as soft-shell crabs? Soft-shells are simply regular crabs that have shed their shell as part of the growth process. For a few days after they molt their whole body is soft and you can eat the whole dang thing. Crabbers who sell these tasty little morsels catch them when they’re still hard, and then watch for the (obvious, at least when it comes to the most popular crabs) signs of an impending molt. These “buster” crabs are separated out into their own cages — jokingly called crab condos — because the soft crabs are vulnerable to being torn to pieces if kept in a tank with others, and then checked every day. As soon as the molt happens the crabs are rushed to market or to a restaurant, because their shells will harden again in anywhere from a day to a few days. They are delicious, and people will pay top dollar for them, but the whole process of getting a soft-shell crab is premised on being able to identify the crabs that are about to molt, and Gabby Brandt realized nobody had any idea what to look for in these green crabs. So there goes one year. From what Gabby’s lab could observe, European green crabs offered absolutely no clue as to when they were about to shed their shells. 'sup buddy. Are you about to molt? Around the same time that Gabby was going through years of frustration, Marissa McMahon — scientist from Maine that works with a non-profit called the Manomet Center — had a conversation with an acquaintance named Jonathan Taggart, a fine arts conservator who spent a lot of time in Venice, Italy. It’s a little bit boggling to think about this, but green crabs invaded America in 1817. So it was 199 years from that date before Western scientists working on this problem first became aware of the fact that the invasive scourge of our estuaries is also a delicacy in Europe, called moleche. I tell Marissa that it sounds like wizardry, but she insists it's just a matter of knowing what to look for and lots of practice. The Italians taught her that the pre-molt crabs have very faint rings around their belly scales… that their rear ends start to inflate as their shell spreads and water gets inside… that they become dramatically weaker as they get closer to a molt. Can you tell which crabs are ready molt? it's pretty hard to tell, right? … while the other says 80% with this pattern will molt. You might have thought you were signing on for a story about delicious soft-shell crab po’ boys, the truth is this is a story about the limits of science. While I am a big fan of the scientific method, but science has some big blind spots. For instance, the fact that scientists mostly hang out with other scientists and not, say, Mediterranean crabbers. Centuries old, traditional ways of doing things are often the results of generations of experimentation. How did the first Venetian crabbers figure out which green crabs were about to molt? I can only speculate, but I can tell you it wasn’t with high resolution cameras and computer analysis. They must have had to catch a lot of them; hold on to a lot of them; watch them carefully every day; turn them over and over in their hands; fishing season after fishing season. Hundreds of observers without phones or television to distract them spending years on the water, observing hundreds of thousands of crabs. Then they showed their children, who showed their children. How could a few people in lab compete with centuries of data like that? One can take this idea too far — I’m not going to argue the old ways are always better. But I think it’s pretty fair to say, and science has begun to recognize, that there are vast stores of discoveries that we could tap into if science started to take a closer look at traditions and ancient skills. Paolo has created an 11-page guide to crab molting, but even he says you really can’t learn except by sorting crabs side-by-side with an expert. When you add in the fact that the crabs on our shores appear to be a slightly different sub-species, that is now hybridizing with the Icelandic green crab, it makes it very hard to learn this skill from a book. Which is all to say that for this to work in New England, somehow this particular skill will have to make its way across the Atlantic. It may have already begun. In New Hampshire, one fisherman has built a side-business of selling green crabs as bait to sport anglers trying to catch tautogs. In Maine, two fishermen have begun to sell soft-shell crabs to restaurants in the MidCoast region: Jonathan Taggart, and a lobsterman who went to Venice with Marissa and Paolo, Chris Jameson. The day I met him, Chris had about 30 crabs that he had identified as pre-molt, and that had shed their shell once he separated them into their individual crab condos. He took those soft-shells to a high-end restaurant later that day. He texted me after meeting with the chef, and told me the crabs sold for $30 a pound. They told him to bring more as soon as he had them. Sam Evans-Brown and Logan Shannon, with help from Hannah McCarthy, Justine Paradis, Taylor Quimby, Nick Capodice, and Jimmy Gutierrez. Erika Janik is our Executive Producer. Maureen McMurray is the director of excellent nature puns. Special thanks to Luke Porrier, Dwight Souther, Jonathan Taggart, and the Gulf of Maine Research Institute. Music in this episode by Ari De Niro, Podington Bear and Blue Dot Sessions.